On Friday, I was privileged to work with my second set of twins of the week. The difference was that Friday's twins (as opposed to Sunday's) were a boy and a girl. Which means that while the bris took place, the sister was sleeping in her crib. Anyway, the bris took place at home, where the living room was adorned with signs that say "It's a Boy!" 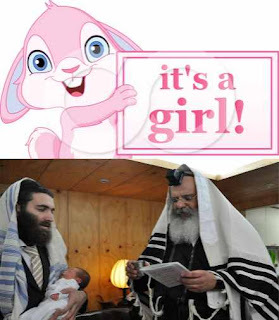 and "It's a Girl!" 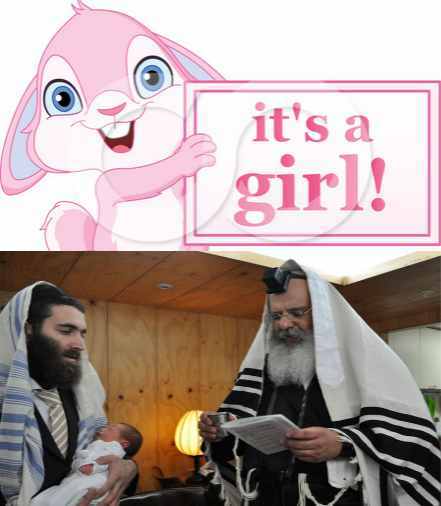 The bris spot (meaning where the chairs were set up) happened to be under the pink sign, and before he recited the blessings over the bris, the rabbi of the community remarked, "This is the first time I have ever done this under an 'It's a Girl!' sign." Should the Father DO the Circumcision?